Read the latest news from IATP, plus Asbestos news from the UK & around the world. The container ship MV Justus, built in 1995 by Polish shipyard Gdynia Stocznia, spent most of its 19 years plying the seas with a European pedigree. It was first owned by a German ship fund run by Hamburg-based asset manager König & Cie. But like a growing number of aging vessels, the MV Justus changed its nationality only months before being taken out of service. In doing so, it avoided a late 2013 measure by the European Union that banned ships registered in its 28 member nations from using dangerous tidal beaches for ship demolition work. On July 9, 2014, the ship changed its flag to that of the tiny Caribbean island nation of St. Kitts, according to data from NGO Shipbreaking Platform, a coalition of environmental, human rights, and labor rights organizations working toward safe and clean ship recycling. Then, after starting a journey from Las Palmas in the Canary Islands on July 15 and sailing through Port Said and Dubai, data compiled by Bloomberg show, it ended up on Aug. 17 near Bhavnagar, off the coast of the Indian state of Gujarat—defying a year-old restriction from the EU. On Aug. 28, now under an owner called Malwi Ship Breaking, according to Indian government data, the MV Justus docked at Alang, the ofttimes dangerous yard where the world’s ships go to die. True to form, about a month later a worker was killed when he fell from a high ladder while breaking up the vessel. Another was severely injured. König & Cie. spokesman Detlef Seiler said via e-mail that the ship had declared insolvency. “The sale for scrap was entirely in the hand of the [insolvency] administrator and the financing bank,” he said, and König & Cie. wasn’t involved in the ship’s flag change. Calls to a number for Malwi went unanswered. 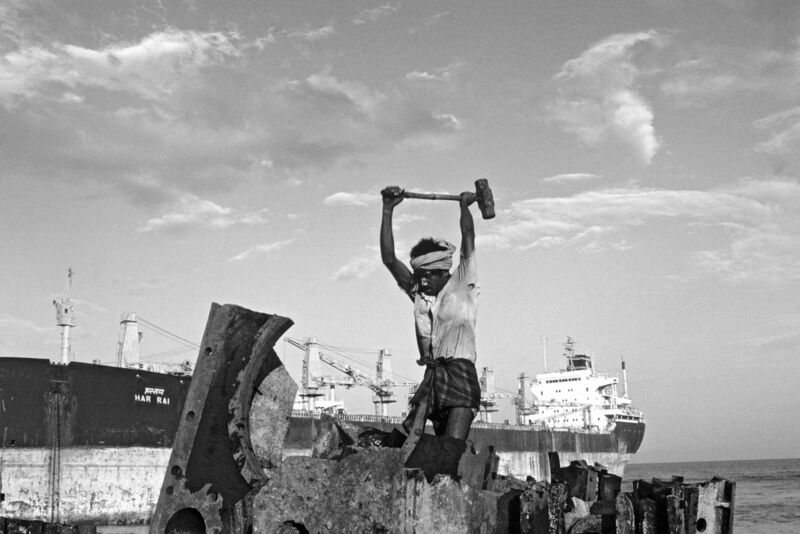 Alang’s 11-kilometer (6.8-mile) stretch of land has become the world’s largest yard for what’s known as shipbreaking, the dirty, deadly work of tearing apart massive vessels so that their steel and scrap can be sold or junked. Besides St. Kitts, the flags come from such places as Comoros, Nevis, and Tuvalu, Heidegger says. Although it could be used by shipowners to sidestep current EU regulations, the process of changing registration is not illegal. Vishwapati Trivedi, India’s shipping secretary, did not respond to interview requests. Nitin Kanakiya, the secretary of India’s Ship Recycling Industries Association, says many owners register their ships in such havens as the Bahamas, Liberia, and St. Vincent for their stricter privacy laws, not in attempts to escape safety rules. Jakub Adamowicz, a spokesman for transport at the EU, didn’t respond to an e-mail seeking comment. In 2014 as many as 181 European ships were beached in Alang, says Shipbreaking Platform, which compiles the data from ship buyers, other nonprofits, and maritime databases. As many as 27 of them changed flags before entering Indian waters, it says. Ships entering India included oil and chemical tankers, according to Gujarat government data obtained by Bloomberg. Fatal accidents are common in Alang. One morning last June, five workers were breaking up a chemical tanker when a blast near the ship’s engine room killed them. Two weeks later, Prime Minister Narendra Modi halved the tax on ships imported to be broken up, potentially boosting the $2 billion industry that left at least 21 workers dead in 2014. The Federation of Ship Recycling Associations, a group of ship recyclers from Bangladesh, India, and Pakistan, will meet in Singapore in March to jointly oppose the EU ban, it said in a statement. The bottom line: European Union ships are barred from using India’s Alang beach for ship demolition, but many sidestep the restrictions. If you use social media don’t forget to join IATP on FB for daily asbestos news and twitter @IATP_Asbestos our Linked In account is now active. The IATP dedicates memorials to the remembrance of those affected by asbestos. Need help finding a training provider? Call us today on 0800 865 4287 or email info@iatp.org.uk.